Once you have decided to place your property on the rental market in the Cayman islands, you are more than likely to have a pretty good idea on how you would like your tenants to conduct themselves while occupying your property. Not all tenants will automatically share your views, for this reason you will need a good lease in order to prevent tenants from unwittingly causing you problems and will give you grounds to evict should the need arise. Beyond the basic guidelines for paying rent, you may need to address other areas of concerns when deciding to put your property on the market. General Conduct - Tenants should conduct themselves in a manner that doesn't disturb other tenants or neighbors, you will need to establish the need for "quiet enjoyment" of the property so that it is clear the music and loud noise will not be tolerated, this is outlined in the majority of the strata bylaw established in the Cayman Islands rental properties. In addition you should make it clear that drug use and any other criminal activity will not be tolerated. Parking - Make it clear as to where your tenants are able to park and how many vehicles are permitted to be parked on the property. You may need to establish that all non-operational vehicles be removed from the premises. Garbage Removal - Make it clear that trash needs to be disposed of in a timely manner in the designated garbage area on site. Alterations to the Property - Everyone wants to make the place feel like home, so its important to be up front and explain what can and can't be done in regards to painting, hanging pictures, etc. 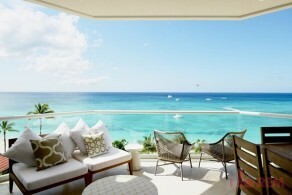 Proper Use of Outside Space and Common Areas - The Cayman Island real estate rentals, have strict rules to ensure that the property stays neat and tidy, so its imperative that tenants know what they can and can't store outside and if not BBQs are allowed to be used on the patio areas or only in the designated areas. Pets - If you are going to allow pets in your home, Cayman Island rental agents strongly recommend that landlords insist on a pet deposit, which is refundable only after the entire house has had a deep clean, which includes all furniture being professionally cleaned, along with the carpets being shampooed at the cost of the tenant. Guests - Overnight guests are fine from time to time but in order to prevent a situation where more people are living in your unit than stated on the lease, its advised that the tenants obtain permission from the landlord for any guests wishing to stay for over 14 days. Maintenance - Make it clear from the beginning that any maintenance issues need to be reported as a matter of urgency. Remind tenants that any damage that is caused by their negligence will be at their cost. Expected Condition Upon Move Out - As Rental Agents and Property Mangers in the Cayman Islands, we have a strict move out procedure in place, which is given to the tenant upon notice of their lease. This letter lays out exactly how the unit is expected to be returned to us, this way it is clear to the tenants what they need to do in order to have their security deposit refunded.